Before we look at each bike, let me reveal a change to our testing protocol. Normally when reviewing bikes I fit my own clipless pedals. 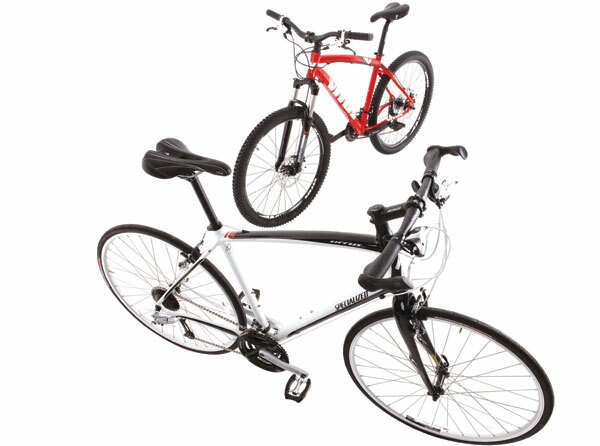 But because these are both entry-level machines, and because we wanted to know how immediately effective they are for new riders — potentially commuters — I kept the pedals that came in the box and wore normal trainers rather than cycling shoes. Both sets of supplied stompers were hugely underwhelming. The Specialized’s were simply unimpressive but, considering its off-road aspirations, the grip-free pair fitted to the Vitus were particularly useless. That means along with your new bike please budget for a pair of clipless pedals and cycling shoes — they will enhance your enjoyment of these bikes no end. Now to the test. Firstly, we know we are playing devil’s advocate here by testing these machines under the auspices of ‘extreme commuters’. The Sirrus really isn’t meant to go off-road and Specialized would say it has plenty of other bikes in its catalogue that could match the Vitus. Meanwhile Vitus would say that any fool could see its bike wasn’t designed for effortless urban riding. So why did we do it? Well, we often see people riding the wrong type of bike for the wrong purpose. While we positively encourage cyclists to explore as many pedalling experiences as they can, if you’re going to be doing something day in, day out — such as commuting — please make sure it’s as easy and enjoyable an experience as possible. To that end, for urban commuters, the Specialized couldn’t really be any better even if it was custom built. It fairly cruises through the urban jungle. I remember in one of his many grandiose proclamations about bike riding, London Mayor Boris Johnson said cyclists are the kings of the roads. Any commuter on the Sirrus would probably share those sentiments — you have great vision, complete control, and a vantage point that seems to confer regal poise. Off-road it can’t cut the mustard when things get very tough, but it handles moderate forays from asphalt adequately. A change of tyre might help things, but even as it stands, that quick dash through the park or over grass won’t upset it too much. The Sirrus is a bit like a small hatchback car, you wouldn’t fancy its chances at a 4×4 adventure day, but it’s a darn sight easier and cheaper to drive to work than a Range Rover. So the Specialized wins because it is the best choice for most people’s commutes. But let’s make one thing clear: the Vitus Nucleus 0.1 is a great bike. In fact, it’s as good at being an off-road machine as the Sirrus is at being an urban warrior. The spec is incredible, the frame looks great, and the tougher the conditions, the better it copes. Used correctly, the Nucleus is great fun and perhaps there’s a strange justice that its on-road ability is lacking — otherwise you might never reach work, opting to continue riding instead. We know times are tough, and cash is in short supply, but if ever there was an argument for owning two bikes — one for weekdays, one for the weekends — this is it. Just think of all that money you’d save on petrol and train fares.